We are working as missionaries to university students in Calgary, Alberta. We’d love if you’d partner with us in this vital mission! There are a few ways that you can give. Please note that giving options differ if you live in Canada or the US. For each donation made, a tax receipt will be mailed to the address you provide. We are so very grateful for each person who partners with us. Thank you in advance! If you’d like to set up a re-occurring monthly donation, click here to access a form from FaithLife that can be emailed to johnsok@ucalgary.ca. Please make a note on this form that this is to be directed to Phil Aud at the University of Calgary Campus. If you would like to make a one-time donation, it is best to do so through CanadaHelps by clicking here. Once at the site you will see that there is a drop-down menu where you can select where this donation is to be directed. 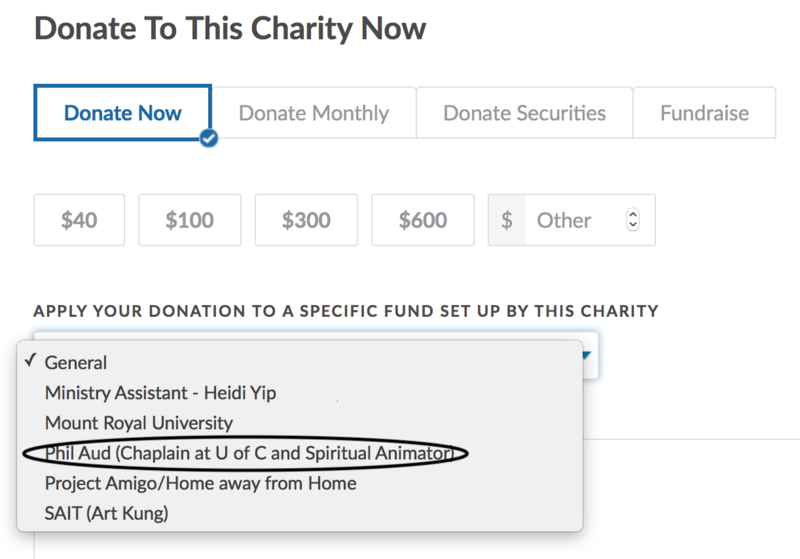 Please select “Phil Aud (Chaplain at U of C and Spiritual Animator)” (see below). Please note, CanadaHelps receives 4% of this donation as a part of their administration fee. Cheque made payable to: University Campus Ministries. We are excited to be Georgia Missionaries with the Assemblies of God. If you are in the US – and not a part of our home church (see below) – it is best to give through the Georgia Assemblies of God District website by clicking here. Here you can either set up a monthly donation or a one-time donation. 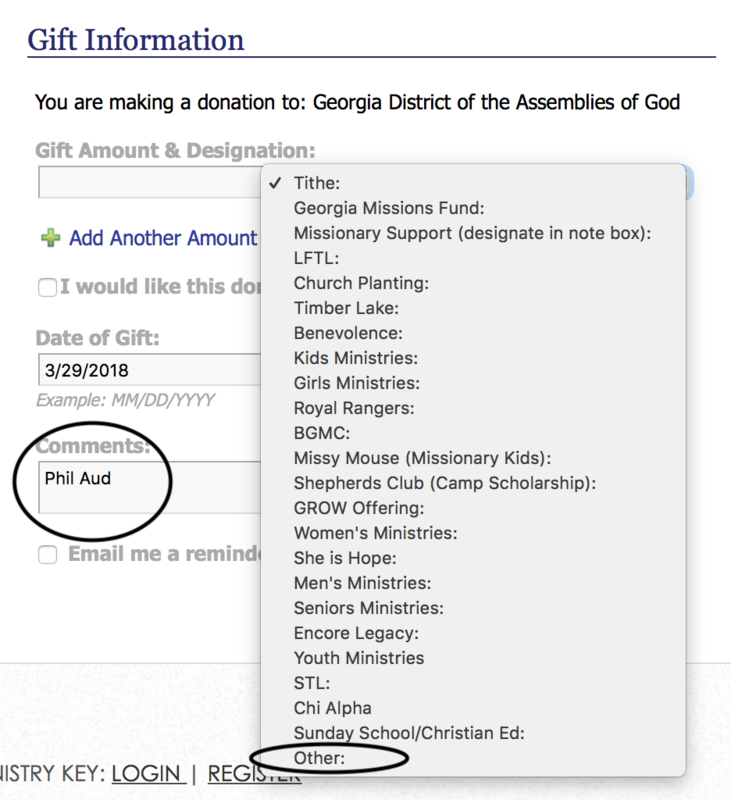 To be sure that the contribution is directed to the mission we are a part of, please select “other” from the drop-down menu and write “Phil Aud” in the “Comments” box (see below) and all monies will be directed to our mission at UCM. If you are a part of Trinity Church (Sharpsburg, GA), you can give in the offering and make a note that it is for Phil and Marisa Aud. 100% of this donation will go to the mission.